The Earth, Wind & Particles group focuses on understanding the physics of wind-blown sand and snow (aeolian processes), and the interactions of the resulting particulates (particularly desert dust) with the Earth system. Dust particles impact climate by scattering and absorbing sunlight, seeding clouds, and by darkening snowpacks and fertilizing ecosystems upon deposition. Dust also presents a hazard to human health and degrades the generation of electricity from solar panels. Many of these effects are only starting to become understood, which is problematic because the amount of dust in the atmosphere is known to be quite sensitive to climate changes. Changes in climate due to the rising concentration of greenhouse gases could thus trigger large changes in atmospheric dust loading. This would in turn either oppose or enhance anthropogenic climate changes – we don’t currently know which! In addition to dust producing possibly important climate feedbacks, about a quarter of current dust emissions are (in)directly due to human actions, such as land use changes, which are considered an anthropogenic forcing of the climate system, similar to the emission of greenhouse gases. Research in the Earth, Wind & Particles group can be roughly divided in two categories: work on answering big picture questions, such as “what is the radiative effect of desert dust on Earth’s radiation budget”, and work on understanding small-scale processes, such as “how does the emission of dust aerosols vary with wind speed and soil properties”. These top-down and bottom-up research approaches fertilize each other: answering the big picture questions usually requires a detailed understanding of the underlying small-scale processes. Vice versa, determining which small-scale processes are worthy of detailed study is informed by an understanding of where the main uncertainties lie in answering the big picture questions. We use analytical and theoretical methods, simple first-principles numerical models that run on desktop computers, and large-scale climate models that require supercomputers. My group also occasionally conducts targeted field and laboratory measurements. Our group strives to answer fundamental questions related to the impacts of desert dust on climate and society. How much dust is actually in the atmosphere? Does dust warm or cool the climate, and by how much? Will future climate-induced changes in the desert dust oppose or enhance anthropogenic climate change? What are the impacts of dust on the hydrological cycle? What are the global health impacts of the inhalation of dust aerosols? Climate models have long been the main tool in answering such big picture questions. However, these models suffer from a key weakness: they need to prescribe poorly known attributes of dust, such as the sizes and optical properties of dust particles, and thus cannot represent the experimental uncertainties in those attributes. To make matters worse, many climate models prescribe dust attributes that are inconsistent with experimental and observational results. The consequent biases in model simulations have made it difficult to determine the impacts of dust on climate and society. Recently, my group has developed a new methodology to determine desert dust effects on climate and society. Specifically, we developed an analytical framework that constrains key determinants of dust effects on the Earth system, such as the amount of dust in the atmosphere, its sizes, and its optical properties. This analytical approach is more accurate than conventional ensembles of climate model results because it directly integrates observational and experimental constraints on the properties and abundance of atmospheric dust. We have used this methodology to constrain the effect of dust on the Earth’s energy balance (paper here). We found that current models have a clear bias towards fine dust. Since fine dust cools by scattering solar radiation, whereas coarse dust warms by also absorbing solar and terrestrial radiation, we found that the effect of dust on the climate by “directly” scattering and absorbing radiation is actually substantially less cooling than models have thus far calculated (see here for an interesting commentary). Correspondingly, we also found that this “direct” impact of future climate-induced changes in atmospheric dust loading will likely not be a major factor in future global climate changes, though it could very well be important to shaping the climate of regions close to major source regions, such as the Mediterranean and the Middle East (paper here). Current and future work will determine dust effects on human health, the hydrological cycle, and the contribution of dust loading changes to 20th century climate change. To be able to answer the fundamental questions of the interactions between dust and climate, an accurate representation of dust emission in climate models is a necessity. However, dust emission is a fascinatingly complex process that depends on interactions spanning length scales from micrometers to 1000s of kilometers, making it very difficult to represent accurately in weather and climate models. My group thus strives to develop analytical models for dust emission that can be readily implemented into large-scale climate and weather models. We do so using a combination of theory, numerical modeling constrained by measurements, and the occasional field measurements. Part of the complexity of dust emission arises from the fact that dust aerosols are rarely lifted directly by wind, but are instead predominantly emitted through an intermediary process called saltation (see animation). In saltation, larger sand-sized particles (~70 – 500 um), which are more easily lifted by wind because their cohesive forces are small compared to aerodynamic forces, move in ballistic trajectories. The resulting impacts of saltating particles can ‘crack’ the soil in a manner that is analogous to the fragmentation of a wine glass when dropped on the floor. In past work, our group has shown that this analogy of dust emission with brittle fragmentation yields an accurate and scale-invariant expression for the size distribution of dust aerosols at emission. Our group has also developed a physical theory for how the flux of dust aerosols depends on wind and soil conditions. This theory shows improved agreement with small-scale (in situ) measurements of dust emission and seems to improve simulations of the dust cycle with climate models. Since saltation is central to understanding dust emission, our group also works on the physics of wind-blown sand and, more generally, on the physics of aeolian processes. 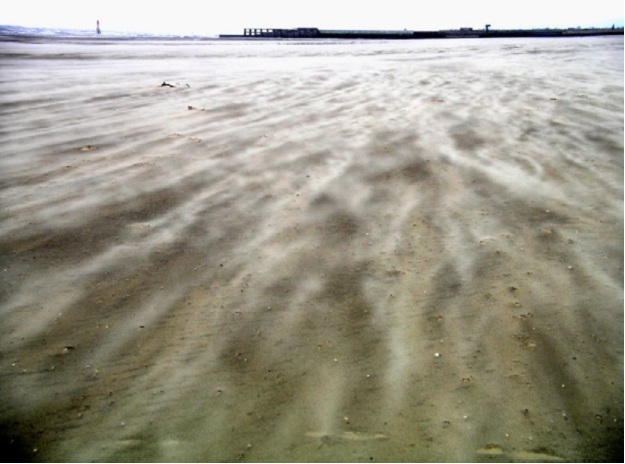 We have developed COMSALT, a numerical model of wind-blown sand written in MATLAB, that is freely available to interested researchers, and can be downloaded here. In addition to contributing to understanding and describing sand transport and dust emission, COMSALT has also been used to understand sand transport on Mars and Saturn’s moon Titan, and to understand mega(ripple) formation. Saltation, and thus dust emission, is driven by turbulent winds close to the surface, which are characterized by strong spatial and temporal fluctuations in speed and direction. Consequently, saltation is highly intermittent, with pronounced variability on timescales of seconds to hours. In contrast, existing sand transport and dust emission models describe saltation as a process that is uniform in time and space, and driven by a constant downward flux of horizontal fluid momentum. This disconnect between theory and models on the one hand, and the reality in the field on the other, is likely one of the main causes of the often poor performance of parameterizations of sand transport and dust emission. The Earth, Wind & Particles group strives to overcome these deficiencies of ‘classical’ saltation theory by bridging the gap between the small scales on which dust emission takes place (centimeters to meters) and the large scales on which dust affects weather and climate (1 – 10,000 km). We do this using a combination of theory and numerical modeling of saltation, laboratory and field campaigns, Large Eddy Simulation (LES) modeling (in collaboration with my colleague Marcelo Chamecki), and global modeling. Pockets of sand transport on a beach, clearly showing the spatial and temporal variability of naturally-occurring sand transport (and thus dust emission). Photograph courtesy of Andreas Baas. Although our group’s main research interests are in the Earth sciences, we’re also interested in solving extraterrestrial puzzles by applying terrestrial insights. In particular, aeolian processes are of great importance to our dusty planetary neighbor Mars. To better understand how all this aeolian activity is possible on a planet with an atmosphere less than 1% as dense as our own, our group used a combination of numerical modeling (COMSALT) and theory (papers here, here, and here, work partially done in collaboration with Rob Sullivan). We found that the low Martian gravity and vertical air drag combine to make bouncing Martian sand akin to playing golf on the Moon: particles travel much higher trajectories than on Earth, allowing them to gain substantial momentum even in light winds, so that on landing they splash up enough new particles to keep transport going at low wind speeds. This hysteresis effect – transport is difficult to initiate yet easy to sustain – could allows Martian sand and dust transport to occur for wind speeds an order of magnitude lower than previously thought possible. In fact, rather than saltation occurring continuously for high wind speed as on Earth, we think that saltation on Mars might occur in “clusters” that are initiated by rare lifting events, and sustained by relatively moderate winds (see video below). These findings help explains a long-standing contradiction (see NPR story here): that sand moves in many areas of Mars, even though wind speeds are only rarely sufficient to set the sand grains in motion. Observations of Martian sand transport rates, the properties of ripples and dunes, and the inferred threshold wind speed for sand transport, have provided limited experimental support for this hysteresis theory. This movie from the Curiosity rover shows a dust devil racing across the landscape. If you look closely, you’ll also see two white streaks, which we think are saltation clusters. This video was prepared by Mark Lemmon (TAMU & JPL), and the link to the original JPL/NASA page is here. Since our work is funded by taxpayer dollars, and because the ultimate objective of my work is to benefit society, we strive to communicate interesting research findings to the public using the media. Interesting media stories on my research have appeared in the print magazines The Economist, PhysicsWorld, New Scientist, Science News, and the well-known scientific journal Nature. Some interesting online stories are at MSNBC and Wired.